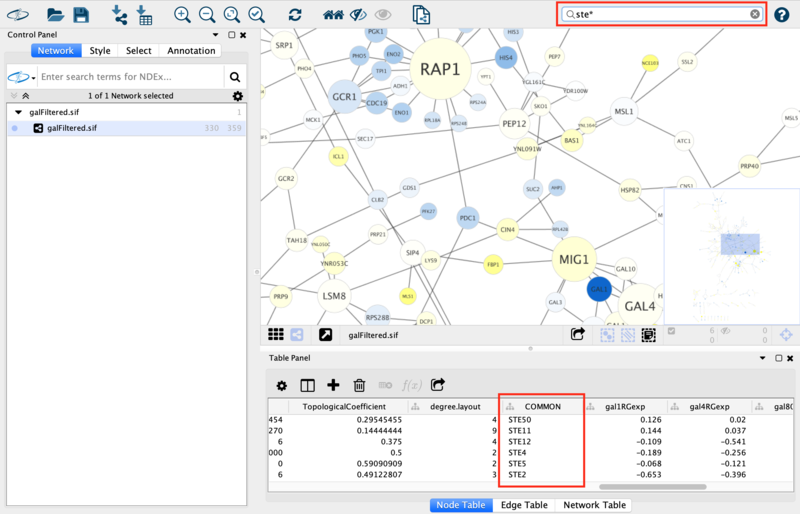 You can search for nodes and edges by column value directly through Cytoscape’s tool bar. For example, to select nodes or edges with a column value that starts with “STE”, type ste* in the search bar. The search is case-insensitive. The * is a wildcard character that matches zero or more characters, while ? matches exactly one character. So ste? would match “STE2” but would not match “STE12”. Searching for ste* would match both. To search a specific column, you can prefix your search term with the column name followed by a :. For example, to select nodes and edges that have a “COMMON” column value that starts with “STE”, use common:ste*. If you don’t specify a particular column, all columns will be searched. Columns with names that contain spaces, quotes, or characters other than letters and numbers currently do not work when searching a specific column. This will be fixed in a future release. Note: Escaping characters only works when searching all columns. It currently does not work for column-specific searching. This will be fixed in a future release. The Select tab in the Control Panel can be used to create selection expressions for selecting nodes and edges. On the Filter tab are narrowing filters, which can be combined into a tree. On the Chain tab are chainable transformers, which can be combined in a linear chain. Narrowing filters are applied to all the nodes and edges in the network, and are used to select a subset of the nodes and edges based on user-specified constraints. For example, you can find edges with a weight between 0 and 5.5, or nodes with degree less than 3. A filter can contain an arbitrary number of sub-filters. To add a filter click on the “+” button. To delete a filter (and all its sub-filters) click the “x” button. To move a filter grab the handle with the mouse and drag and drop the filter on its intended destination. Dropping a filter on top of another filter will group the filters into a composite filter. The Apply button will re-apply the active filter. On the opposite side of the progress bar is the cancel button, which will let you interrupt a long-running filter. A slider is shown that represents the minimum and maximum values in the column. Drag the two handles to select a range of values. The range values may also be entered manually. is: Selects values that are inside the range. is not: Selects values that are outside the range. The text entered in the text box will be matched against the column values depending on the following options. contains: Selects values that contain the text. doesn’t contain: Selects values that do not contain the text. is: Selects values that match the text exactly (case-insensitive). is not: Selects values that do not match the text exactly (case-insensitive). regex: Selects values that match a regular expression using Java regular expression syntax. This allows for much more sophisticated matching than is provided by the above options. By default string matching is case insensitive. Case sensitive matching requires the use of a regular expression that starts with “(?-i)”. For example to match the text “ABC” in a case sensitive way use the following regular expression: “(?-i)ABC”. Boolean colums can only contain three values: true, false or blank. true: Selects values that are true. false: Selects values that are false. any element: Matches if any value in the list matches the filter. each element: Matches only if all of the values in the list match the filter. The degree filter matches nodes with a degree that falls within the given minimum and maximum values, inclusive. You can choose whether the filter operates on the in-degree, out-degree or overall (in + out) degree. The topology filter matches nodes having a certain number of neighbors which are within a fixed distance away, and which match a sub-filter. The thresholds for the neighborhood size and distance can be set independently, and the sub-filter is applied to each such neighbor node. The topology filter will successfully match a node if the sub-filter matches against the required number of neighbor nodes. You can also reorder filters by dropping them in-between existing filters. The input to a chainable transformer is a set of nodes and edges, either the nodes and edges that are currently selected in the network, or the output of a narrowing filter. Chainable transformers can filter out nodes/edges, or include more nodes/edges. For example a chainable transformer can add nodes that are neighbours of the nodes in the input. 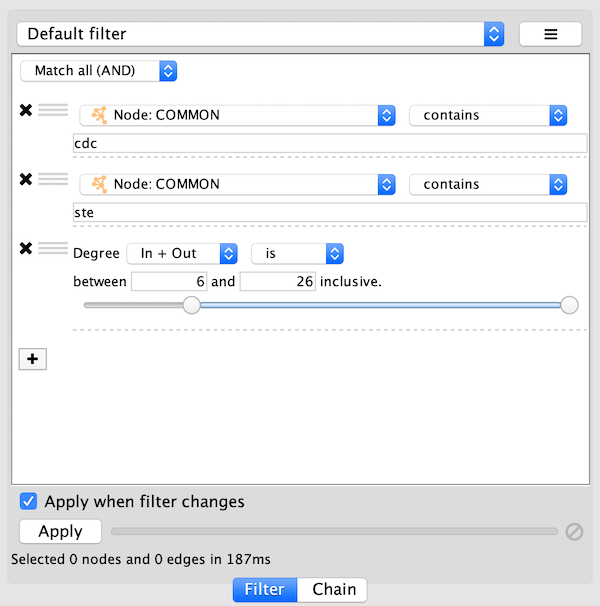 Chainable filters are combined in an ordered list. The nodes and edges in the output of a transformer become the input of the next transformer in the chain. The first transformer in the chain gets its input from the current selection or from a filter on the Filter tab. The output of the last transformer becomes the new selection. 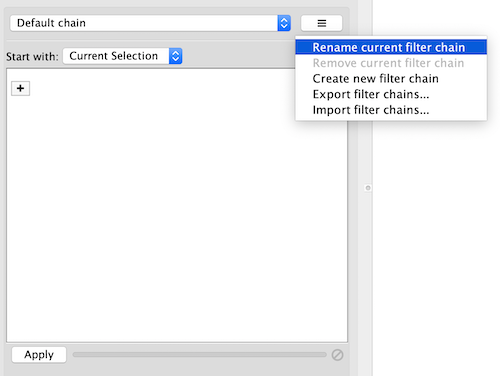 You can specify the input to the first transformer in the chain by selecting a Start with, where Current selection refers to the nodes and edges currently selected. You can also choose a narrowing filter, which produces a different set of selected nodes and edges. Chainable transformer can be reordered by dragging one by the handle and dropping it between existing transformer. This transformer will go through all the input edges and selectively add their source nodes, target nodes, or both, to the output. This is useful for adding nodes that are connected to edges that match a particular filter. Add (default): Automatically includes all input nodes and edges in the output, and adds source or target nodes from input edges to the output. Replace with: Does not automatically include input nodes and edges in the output. 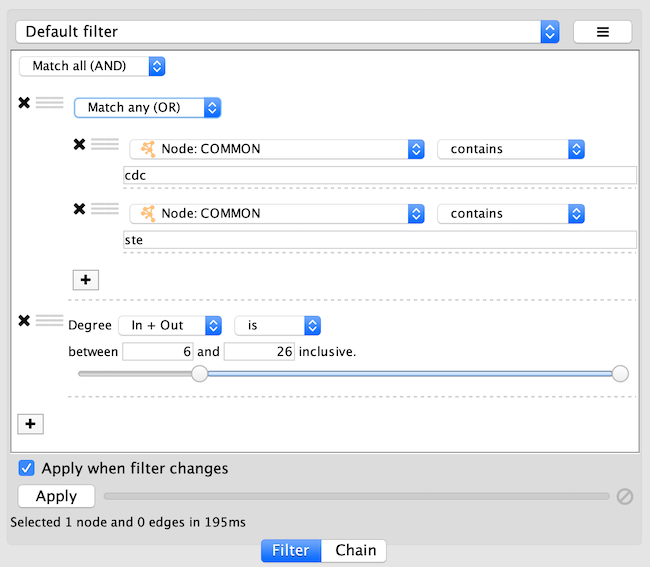 Only outputs nodes that match the filter. A sub-filter may be added as well. When a sub-filter is present the source/target nodes must match the filter to be included in the output. This transformer is used to add nodes and edges that are adjacent to the input nodes. A sub-filter may be specified as well. Note that pressing the Apply button repeatedly may cause the selection to continuously expand. This allows adjacent nodes that are at greater distances to be added. Add (default): Automatically includes all input nodes and edges in the output, and adds selected adjacent nodes and edges. Replace with: Only outputs the adjacent nodes/edges. Adjacent nodes: Output nodes that are adjacent to the input nodes. Adjacent edges: Output edges that are adjacent (incident) to the input nodes. Adjacent nodes and edges (default): Output both nodes and edges that are adjacent to the input nodes. Incoming: Only include adjacent nodes/edges when the adjacent edge is incoming. Outgoing: Only include adjacent nodes/edges when the adjacent edge is outgoing. Incoming and Outgoing (default): Ignore the directionality of adjacent edges. Adjacent nodes and edges: Both the adjacent edge and its connected node must match the filter. Note that for a filter to match an edge and a node at the same time it should be a compound filter that is set to “Match any (OR)”. The name of active filter appears in the drop-down box at the top of Select panel. Beside this is the options button which will allow you to rename, remove or export the active filter. 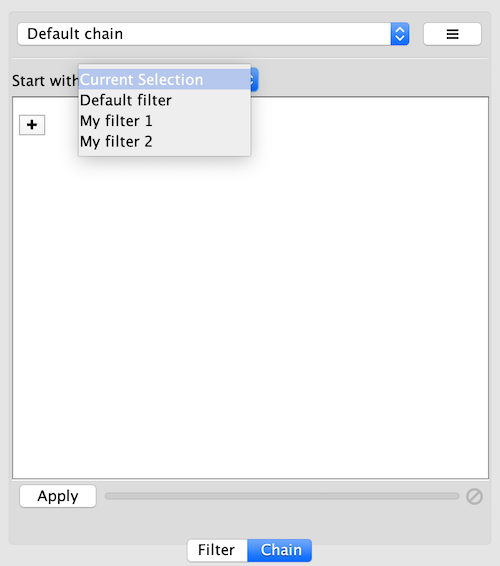 It also lets you create a new filter, or import filters. 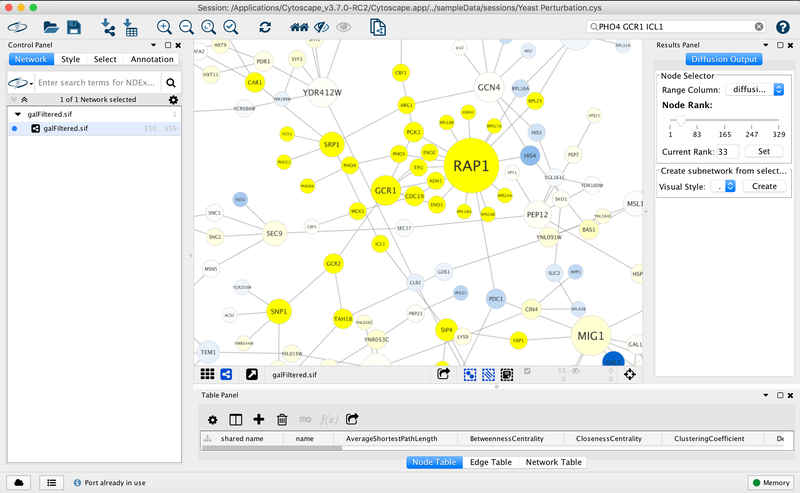 Cytoscape’s Diffusion algorithm attempts to use a set of nodes and an entire interaction network to find the nodes most relevant to the original set. Conceptually, Diffusion applies heat to each node in the set, and lets the heat flow through connecting edges to adjacent nodes. It then produces a list of nodes ranked by the heat they accumulated. A node with many connections will tend to have a higher ranking, and an isolated node will tend to have low rank (and thus be excluded from the resulting node set). By default, Diffusion uses the set of selected nodes as the heat sources, with each node having the same initial heat. At the end of a Diffusion, Cytoscape leaves the top 90th percentile of hot nodes selected. It allows you to use the Results panel to select a higher or lower percentile dynamically. It also stores the node’s initial heat as a node attribute in the “diffusion_input” column, and returns the heat and ranking values in the “diffusion_output_heat” and “diffusion_output_rank” columns. An advanced Diffusion option allows you to specify initial heat values for each node via its “diffusion_input” attribute. This figure shows the result of selecting the PHO4, GCR1 and ICL1 genes (via the search bar) and performing a Diffusion by either selecting Tools → Diffuse → Selected Nodes or right-clicking to Diffuse → Selected Nodes. Diffusion calculated the heat ranking of all 331 nodes in the network, and then selected the top 33. 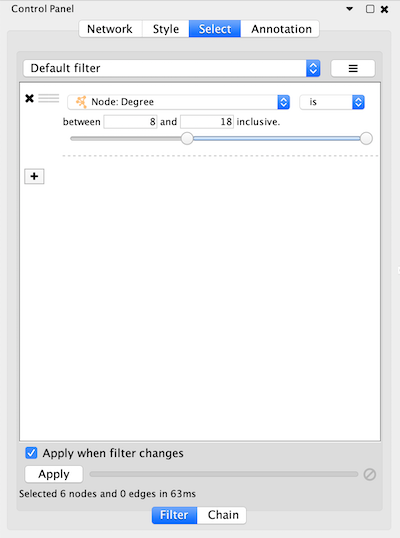 To select more than 33 nodes, move the Node Rank slider in the Diffusion Output Results Panel to the right or enter a number greater than 33 in the Current Rank field. You can also select nodes using a heat value cutoff by using the Range Column to select a column containing heat values. Finally, you can use the Visual Style chooser and Create button to extract the selected nodes into a new network. You can execute Diffusion multiple times on a network, thereby creating multiple heat, output_heat and output_rank columns. The Select → Nodes and Select → Edges menus provide several mechanisms for selecting nodes and edges. Most options are fairly straightforward; however, some need extra explanation.